Armenian president Armen Sarkissian greets demonstrators in the Republic Square gathered to protest the former president's shift into the prime minister's seat in Yerevan, Armenia, April 21, 2018. Armenian President Armen Sarkissian said he is planning to push for constitutional changes to expand the powers of his office less than two months into his first term. Speaking with VOA’s Armenian Service less than a month after Prime Minister Nikol Pashinyan rode to power on a wave of mass demonstrations that lasted weeks, Sarkissian said a constitutional imbalance is threatening to undermine Armenia’s stability as a nation. “The reality is Armenia needs deeper changes to some of the laws in the constitution, and some laws related to the constitution,” he said. “Why? Because first of all, we don’t have a balanced constitution. We have a constitution where a lot of power — most of the power — is given to the government and the prime minister’s office. 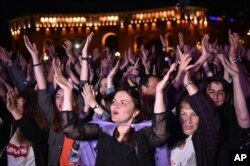 Armenians gather in the capital Yerevan's Republic Square as they wait for Nikol Pashinyan, May 7, 2018. Sargsyan served 10 years as president and was appointed prime minister in April after a series of constitutional changes reduced the role of the president and elevated the role of prime minister. Protesters immediately condemned the move as a ploy to cling to power and demanded that he step down. Sarkissian urged dialogue between his political ally, Sargsyan, and Pashinyan, the protest leader. Sarkissian was soon sworn in as president after being elected by parliament in March. Political power in the South Caucus nation should be divided equally among parliament and offices of the president, the prime minister and his cabinet, Sakissian said. Asked to assess Pashinyan’s performance since assuming the country’s most powerful office in May, Sarkissian said it would be it premature to judge. President Sarkissian also said that Prime Minister Pashinyan, who had long called for massive reforms on everything from human rights to transparent elections to government corruption, may still face an uphill battle in delivering on some of these promises. “Indeed, Armenia needs reforms in many areas, in many directions,” he said, touching on the primary necessity of developing an economically vibrant nation that appeals to foreign investors. 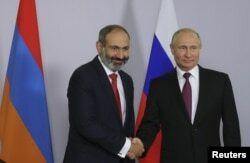 Russian President Vladimir Putin shakes hands with Armenian Prime Minister Nikol Pashinyan during their meeting in Sochi, Russia, May 14, 2018. Regarding foreign policy, which is constitutionally delegated to Pashinyan, Sarkissian noted that Armenia values good relations with Russia. “It is vital for Armenia. Armenia and Russia have proven that they have a track record of being good friends for centuries,” he added. And yet, he added, that does not mean Armenia cannot develop relations with the rest of the world in order to balance its historically close ties with Russia. Armenia, he said, is both a member of the Russian-led Eurasian Economic Union, while maintaining trade agreements with the European Union. This story originated in VOA's Armenian Service.